Since 1981, Judi Warren Blaydon has judged quilt shows and presented lectures and workshops for quilt-makers in the U.S., Japan, Canada and Switzerland. A background in Art Education, an MFA degree and experience teaching Design and Drawing Foundations at the Toledo Museum of Art School of Design and the Bowling Green State University School of Art enable her to convey color and design vocabulary in a supportive and challenging classroom environment and to encourage her students to explore, discover and express personal themes in their quilts. Her work has been included in Quilt National and Crafts National exhibitions and is in private and public collections in America, Japan and Australia. Judi has written articles for American Quilter, Quilts Japan, Patchwork Quilt Tsushin and Quilting Today magazines and is the author of "Fabric Postcards: Landmarks and Landscapes/Monuments and Meadows" (AQS 1995). 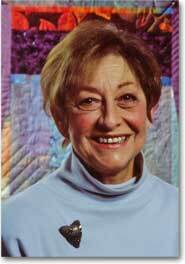 Her recent book, "Collage+Cloth=Quilts: Create Innovative Quilts from Photo Inspirations" was published by C&T in 2010. Her work is included in "88 Leaders in the Quilt World Today" (Nihon Vogue), in Robert Shaw's "The Art Quilt" and she designed the "Buds and Blossoms" fabric for Bernatex, Inc. Her quilt, "The Mountain and the Magic: Night Lights" is in the permanent collection of The National Quilt Museum in Paducah, KY, and 14 of her pieces were exhibited at the The New England Quilt Museum in Lowell, MA, in 2001.